Janna [God Tier Support] - Janna's synergy with Ardent Censer is unmistakable, and ever since the revamp to the yellow gold item, her mana costs in lane are absolutely oppressive against enemy laners. The cooldown on her shield is low enough that harass has nearly no chance of getting through, and results in powerful trades for relatively low effort. Kayn [God Tier Jungle] - Kayn in his current state is freaking annoying. His ability to one shot enemy squishies with Duskblade proc is just a bit too much to handle if he snowballs, and his wall jumps make it extremely difficult to escape, even with summoner spells. The counter of course, is kiting and heavy crowd-control, but that's the counter to everything. Lucian [Tier 1 Mid] - Lucian mid just keeps gaining popularity lately as a strong counter to assassins via his early game all-in potential before the enemy laners can get to level six and start deleting champions on the map. It does require a good amount of game knowledge to use effectively and force the game to a conclusion, but in the right hands it can be quite overwhelming to deal with. Orianna [God Tier Mid] - Ever since her nerf, Orianna's been slightly weaker in terms of winning statistics. However, she continues to be a highly respected play-making champion, and many solo queue players still enjoy picking her up with frequency. Ornn [Tier 2 Top] - Ornn is doing quite poorly on the win rate field, but his kit is interesting enough to make people still try and make him work. Sejuani [Tier 1 Jungle] - Many players are starting to wake up to Sejuani's raw power that she sports, and her passive combined with Gargoyle Stoneplate gives her quite a bit of damage mitigation that can absolutely deny burst damage if used correctly. 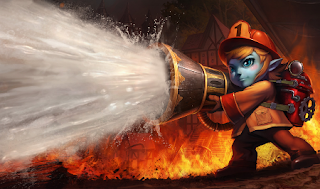 Tristana [God Tier Marksman] - Tristana's quite popular lately as one of the more aggressive marksmen on the rift. Her ability to sustain through laning phase via Warlord's Bloodlust combined with her excellent 1v1 potential results in a great solo queue marksman that is not only safe, but can be suitably aggressive as well. Ziggs [Tier 4 Marksman] - Ziggs has quietly fallen off the face of the earth as a marksman ever since the crit buffs and lethality changes, and there's really not too much reason to play him as a marksman anymore. Maybe if marksmen start losing some of their power or if your team is AD heavy you could toss him in the fray, but otherwise he's almost never seen anymore.